well this is just too cute ! it's a wild shades of blue ! I like it, I like how you took the city back life and ran with but one little lone character in the corner to blend and not look so bland and so only background work. 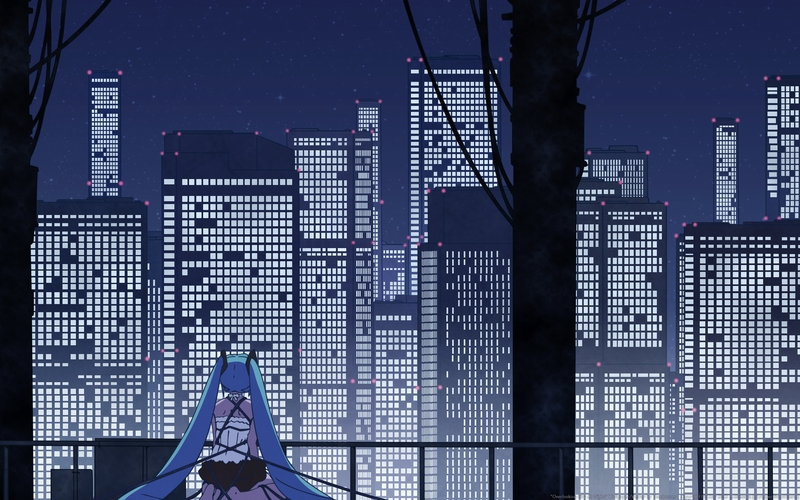 I think you did a good job with this piece as a whole, with Miku and the city life, well done. What drew my attention were the details on the city - what can I say, I love a well done cityscape and, even though there aren't lots of details (in terms of shading), I'd say this works very well when you step back and see the big picture. I also like that the colors and the wallpaper in general are easy on the eye, in spite of all the details (the windows on the buildings, especially). 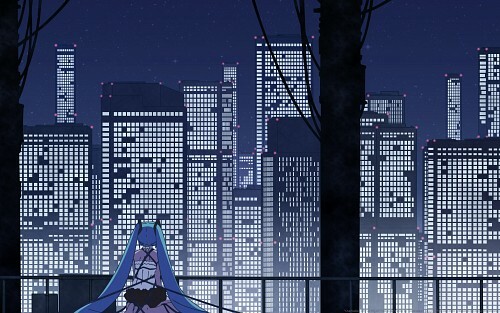 The only suggestions on improving that I have are in regards to Miku: since she's closer to the viewer than the city, it wouldn't hurt to give her more details - for example, two more types of shadows. Also, when working with lines, try to make the tips sharper instead of round; sharp-tipped lines create the sensation of flow and movement, while round tips tend to look more "cartoonish" and make the 2D-ness stand out even more. Overall, I think it's quite good. It can be polished a bit, but it's definitely an improvement from your previous walls, in terms of composition and coloring. Keep trying new things!